The flu bug found us...I think. My husband has it...or something that's very similar to one anyway. He said he's sore all over, he has the sniffles that's why I think it's the flu that got him. The little one is bummed because she can't kiss or hug Dad. She knows the 'rhino virus' and how it spreads so she doesn't dare go 'that' near to Dad...and she doesn't like it one bit....but she knows better so she's trying her best to stay away. When she said goodnight earlier she just had to ask him how long until he's going to get better...lol. She got all excited when Dad said "on the fifth day"...whatever that means. Anyway, here's a certificate she made him on Sunday. 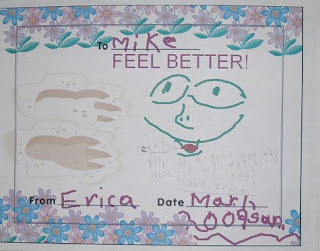 It's a "Feel Better Certificate" according to her. Can you tell she can't wait for Dad to get well ASAP? Hopefully he gets better real soon. He still goes to work even if he's not feeling well. He has to, unfortunately. Your daughter is such a sweet girl. I hope your husband feels okay now. kung maka-mike akala mo magka-contemporary ano? sa bagay mas okay yon. before nga tawag ni ethan sa mommy ay ate twinx. uy! di ba lapit na bday ni unica hija mo? hala, Mike na lang haha, ang cute! but she's really sweet to her "Mike." Daddy's little girl talaga. hope he gets better real soon. mahirap ang may sakit, lalo na ayaw mag rest. wooooooooooh! ang kyut naman mommy j nung certificate..weheheh! What? He's not feelin' well again? Sobrang sipag naman kasi ni hubby e! 'Wawa naman tuloy si Erica, she can't get near Mike. he he.. sweet talaga. Super Daddy's girl! 'Hope he'll feel well soon. Like mo din pala si Joey Albert?! Ganda kasi mga songs nya 'no?! Nice blog you have there, care to exchange link? mana talaga sa'yo ang baby mo....sweet. naks naman! i know a lot gets sick these days. dito sa work dami din out. nway, hope your husband feels better earlier than the fifth day so that the little girl was truly be happy. musta ang wednesday? hope the hubs is now feeling better. 'pag ako si mike, i have to force myself to get well! lol ang galing ni erica. super sweet!!! knock, knock, nasaan ang may bahay? hope your slow day turned out well. musta na mommy j? got u tagged!